With a new year comes another update to the Season Visualiser. This update will focus on the results and the accuracy of the visualiser during the months of November and December, to see if any patterns can be established as we enter the second half of the season. As we did with the previous update, let’s start with a look at the results in the last two months, November and December, to see how accurate the visualiser was for individual matches. For those not already aware, the visualiser indicates the potential outcome on a colour-coded scale, from a dark green for a sure-fire win, to a dark red for a likely defeat, without every shade of yellow in between for the harder to call fixtures. Illustrating the actual results, green indicates a Blackpool win, yellow a draw and red a loss. Once again, the visualiser has done a reasonable job of forecasting the outcome of the games played in November. Only the first result of the month – the 5-0 win away at Leeds United – stands out as an anomaly, with the remainder of the fixtures all going more-or-less as anticipated. November had been identified as the most difficult month of the season based on the visualiser’s interpretation of the fixture list, and six points was possibly the best that could be expected if the visualiser is entirely trusted. However, Blackpool managed to confound expectations in the game at Elland Road while picking up respectable points elsewhere to finish with eight points from the month. Along with the victory at Leeds, the hard-earned draw away to Middlesbrough was a particular highlight in a very tough run of matches. The defeat at Leicester was the only match from which the Seasiders took no points, which was by no means a complete surprise considering the money spent at the King Power Stadium lately. The fixtures during December were a little kinder based on the visualiser’s predictions, with between seven and eight points the anticipated return – ‘Pool achieved in line with that with another return of eight points from five matches, just as they did in November. A win at home to Reading kicked off the month followed by an impressive draw at league leaders Southampton (a game that the Seasiders very nearly won). Both of these results eclipsed what the visualiser had in store for Blackpool, but unfortunately Ian Holloway’s side could only manage a rather disappointing 0-0 draw at home to Watford a week later. The final two games of the month went according to the visualiser’s forecast, but with such a terrible record at Oakwell the victory at Barnsley has to be considered a very good one, regardless of how easy the visualiser would have you believe it may be. A comprehensive defeat at St Andrews on New Year’s Eve ruined the prospect of an unbeaten month, but in the circumstances could be justified, especially in light of Birmingham’s strong home record. At this point it is interesting to revisit the graph which charts the relative difficulty of the fixtures in each month against the actual outcomes of those games. In the October update we could see that the season was somewhat eerily going almost exactly as the visualiser may have predicted, but how have things changed in the last couple of months? According to the visualiser, Blackpool should have been braced for a significant drop in form in November – and on the back of the depressing 3-1 derby defeat at Burnley few would have been surprised. However, a five star performance at Elland Road saw the Seasiders begin November in style as ‘Pool enjoyed their best month since August picking up an average of 1.6 points per game. 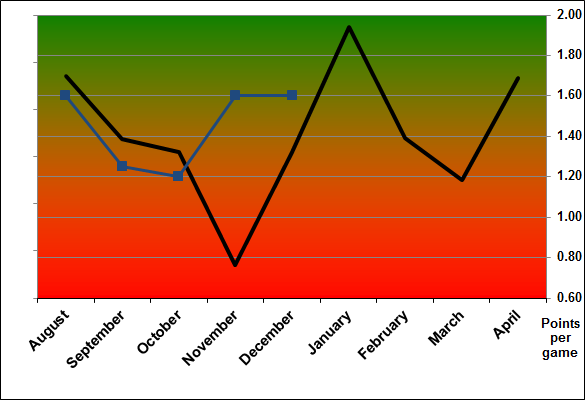 The graph plateaus in December as this points per game ratio was maintained for second consecutive month. January perhaps offers the best chance to break the 1.6 ppg ratio for any given month this season – an excellent 3-0 win over Middlesbrough has given Holloway’s side the best possible start – and one suspects it could be vital in helping Blackpool stake their claim on a play-off place. In terms of how the Seasiders are placed to achieve their goal of an instant return to the Premier League, the club are currently behind schedule on the number of points that are likely to be required for a play-off spot. Based on the generally accepted 75 point threshold, Blackpool were three points below target at the end of January, weighted for difficulty of fixtures. Of course, it could be that the number of points required to secure a play-off place could be lower than 75, as it was in 2009/10 when ‘Pool took 6th spot with just 70 points. However, with even automatic promotion not being ruled out by Holloway and his players, it will be important for a significant upturn in form to try and achieve that ambitious goal. For the time being, an 11 point haul from January would be enough to be on course for at least a play-off place – three points already on the board means ‘Pool require another eight from just three remaining games this month. The mathematicians amongst you will realise eight it’s impossible to get exactly eight points from three games, so in order to avoid being behind schedule, Blackpool will need to beat Ipswich, Crystal Palace and Coventry in the next three league matches. It’s by no means inconceivable, but a reduction of the gap from three points off target would make for a satisfactory month as second half of the season gets underway. Another update to the visualiser will follow early in March when we’ll be looking back at the games in January and February to see how accurate the model has been.